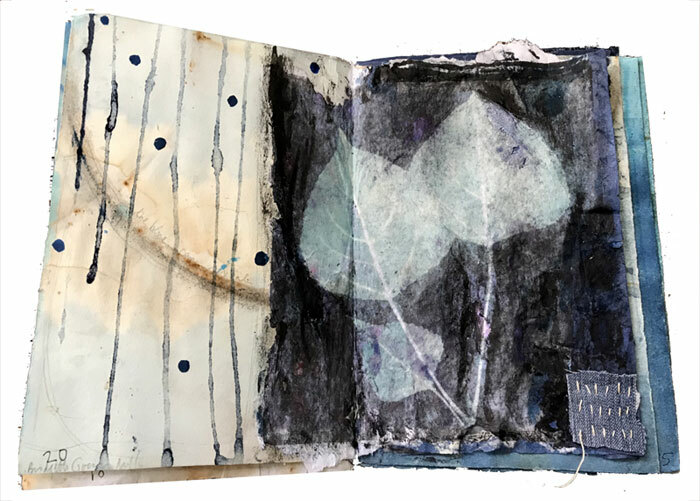 This month I had the honor of holding one of Elizabeth Bunsen’s books in my hands and working in it for the collaboration between 12 artists brought together by Seth Apter. The theme of the book was simply Dwell in the Blue. 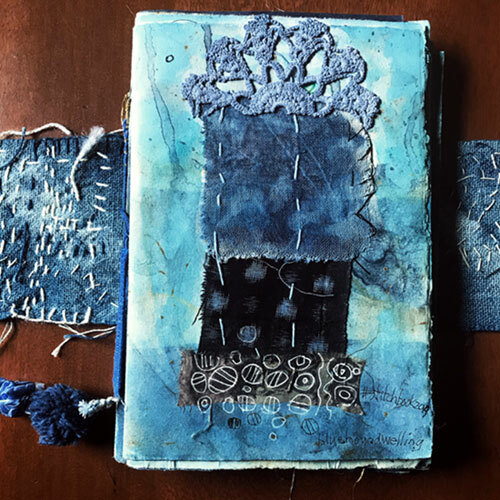 And Elizabeth’s hand painted, hand stitched, hand dyed pages that she bound together were already works of art by themselves. It was both fun and daunting to pick a spread to work on. I ended up picking a spread where the left side was such that I knew I wouldn’t touch it much and the right side was just a plain blue paper. I decided that I’d work on the plain blue side. I did an old school acrylic gel photo transfer of this photo I took back when we lived in Chicago. I remember the moment so clearly. I had brought my kids to one of the play lots in the city and as they clambered around, I laid these leaves down on the black top and snapped a shot of it. I was new to Instragam at the time and was playing around with the filters. It was such a great tool at that time for me with little kids- I was not in the studio as much as I wanted to be, but the app on my phone helped me quickly be creative. I also think it is funny how despite being in the midst of a big city, I was always focusing on finding the nature around me. That’s just me and how I’ve always been. I ended up adding the blue dots between Elizabeth’s drip lines because of my current obsession with dots (see previous post). And I thought I was done and posted a photo on my IG but then the next day I came back and decided to stitch on a denim patch. I mean, how can I not add stitching and cloth to an Elizabeth Bunsen work of art?! Above is a photo of the spread as seen in the book- I love the rough edges and the overlapping papers from the rest of the book. Hello Bridgette! This is SO beautiful!! 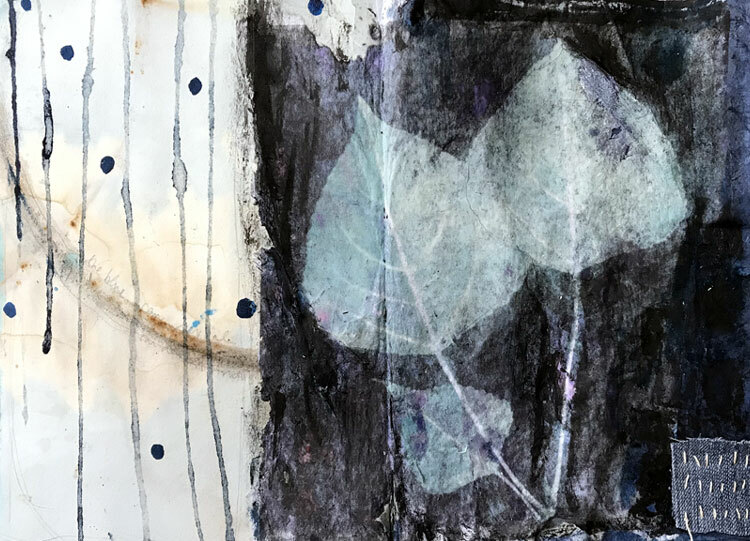 I just got back from a week in AZ with my Dad - so nice to pull this up on my laptop and dwell in your process - can't wait to see and to also receive and work in your book - I am thoroughly enjoying #artx12 - thank you so much for your beautiful, sensual collaborative spread. I am enjoying it too. It's been so great being able to work in the books of people I've admired for many years. To have the work in my hands! Such a treat.